Miss Mani Monster! 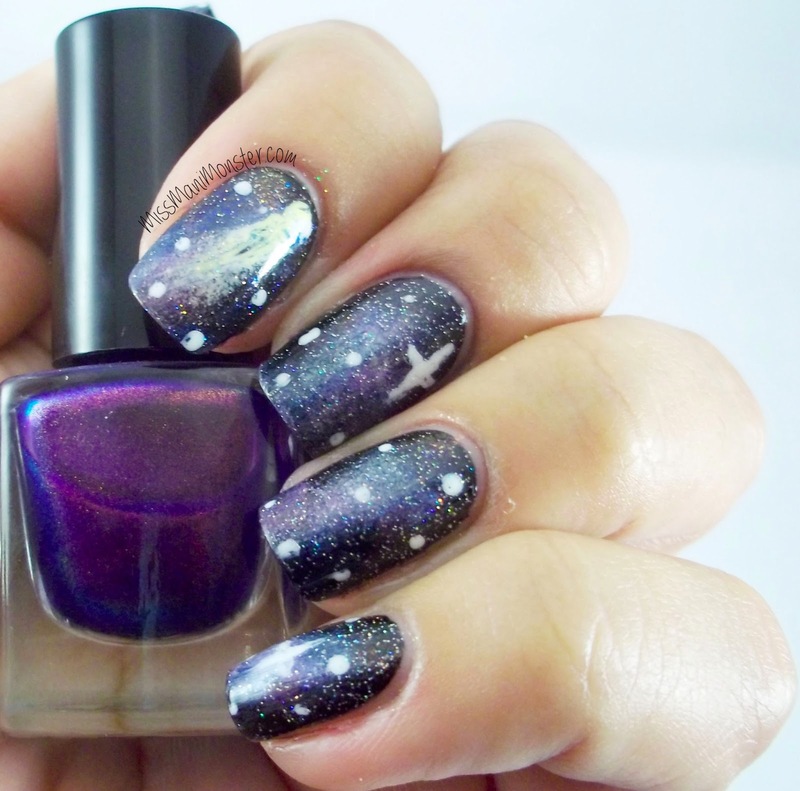 : Polish Days - To Boldly Go GALAXY NAILS! 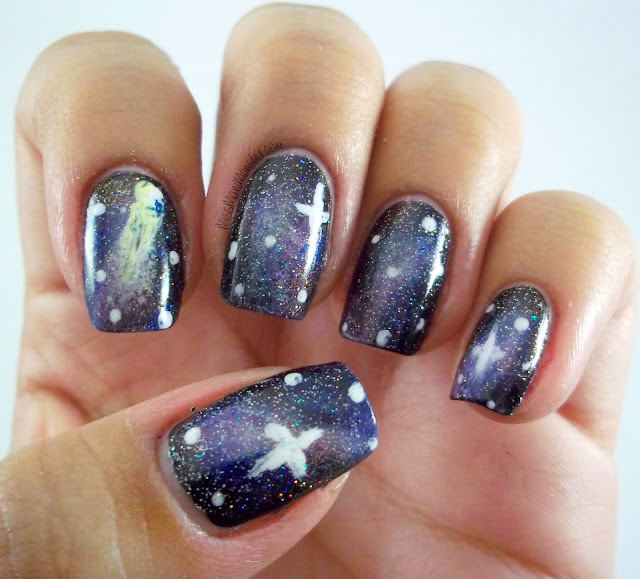 Polish Days - To Boldly Go GALAXY NAILS! 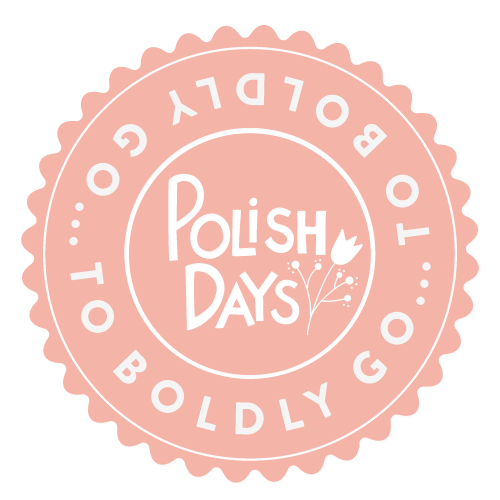 I am so excited to get back into the swing of things with a Polish Days post this month! When I saw the theme for this month, I heaved a sigh and knew it was time to stop avoiding it; I needed to tackle the ever famous galaxy nails! I've been terrified to take it on, because it's always seemed like a really difficult look to achieve. I was pleasantly surprised at how forgiving the look is! I looked at several other bloggers' galaxy nails for ideas of the colors I should used and sponged away. I really didn't use a particular pattern or strategy; I kind of just sponged and played around until it looked right. I'm sure I'll miss a few, because my desk was a mess when I did this, but I used Sally Hansen Black Heart as my base, and then used Priti NYC Hedgehog Rose, China Glaze Lemon Fizz, Essie Bikini So Teeny, Essie Play Date, Zoya Purity, Zoya Song, and Zoya Anastasia. I added some stars, and topped it off with INM Northern Lights to finish off the look. I LOVE IT. I may come back to this over and over again! In the photos, I'm holding Max Factor Fantasy Fire because I used it on my other hand and kind of regretted not using it for this galaxy mani. OOPS! 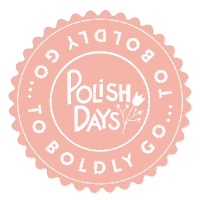 Please take a look at my fellow Polish Days Bloggers' looks, too! Awesome! 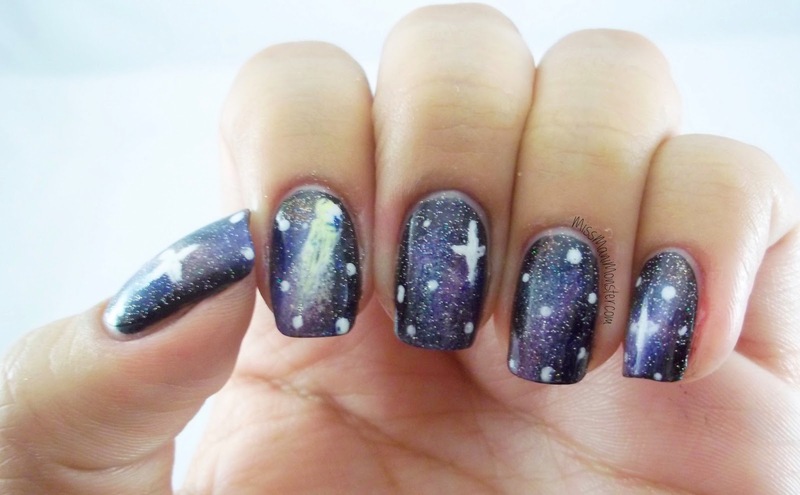 Galaxy nails is definitely a look I *must* try. I love galaxy nails and really need to do some myself soon, too! These are pretty! 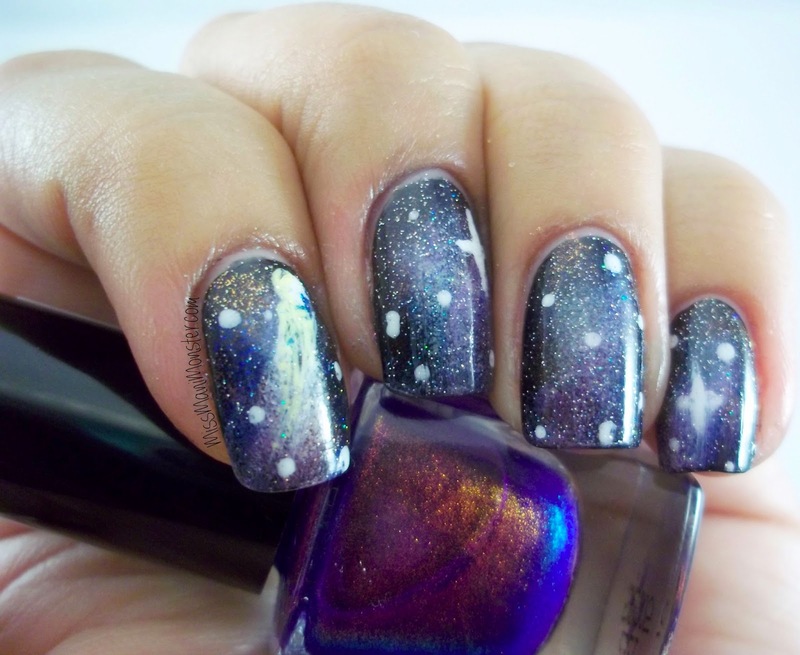 This is an awesome mani. So much depth. Especially love the index finger with the comet.